If you do those two things, then all you need to do is just prep like you normally would prep for an all-ceramic crown with 1 mm axial reduction and 1.5-2.0 mm of occlusal reduction. But I think you will find that if you are using a CEREC, you can modify your preparation to save the most amount of tooth structure. The reason we have prepped the axial walls in the past was for retention and resistance form. 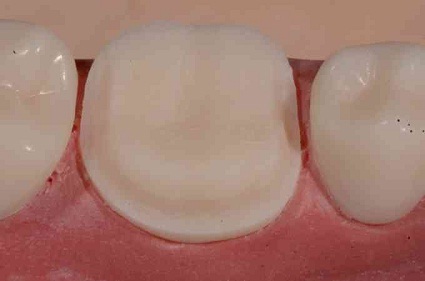 We cemented metal ceramic crowns as those could not be bonded in place. The need therefore to have proper wall length was critical because you needed the wall length to maintain your restoration in place. Fast forward to the adhesive bonding era and you could simply prep to conserve enamel but because you still had to send the case to the laboratory, some traditional retention and resistance form was still needed to keep the provisional in place. Today, with CEREC and no provisionals, if the tooth allows it, the photo below is representative of my full crown preparation. If I don’t need to prep the lingual, I avoid it. If I don’t need to prep the walls, I avoid it. Because we are bonding our restoration on immediately and there is no provisional involved, there is no need to prep to keep the provisional in place. I can keep the maximum amount of tooth structure in place and be as conservative as possible. If the prep looks a bit scary to you and you think your restoration will fall off, by all means continue to prep the way you have been prepping. But I promise you that this is easier to prep, easier to marginate and easier to finish and better for the tooth. Don’t forget the key with all CEREC preps – keep your margins “smooth as glass.” I will share in a future blog what I use to polish my margins and why it’s critical. what do the “no prep on lingual” and “no prep wall” preps look like?